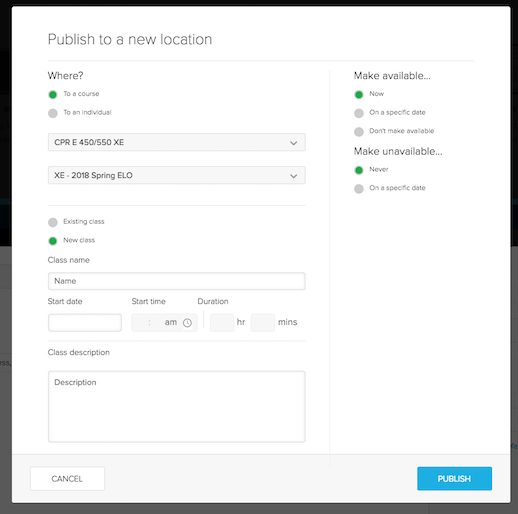 You can easily publish your own videos even if they are created outside of the Echo system. Echo ALP currently supports the following video file formats: .3gp, .avi, .flv, .m4v, .mkv, .mov, .mp4, .ogv, and .wmv. Go to https://www.echo360.org and log in with your Net ID. Go to the Library tab at the top of the screen. 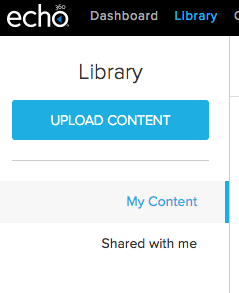 ON the left, choose the Upload content button. You can then drag or browse to your video. Once it’s uploaded, you can click on the video and select the gray Publishing tab (if it isn’t already selected) and then click the blue Publish button.